You've been waiting a long time for your big day, and you deserve to make that big day more special and more about you! 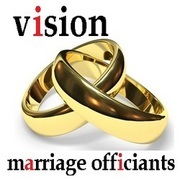 Vision Marriage Officiants are experienced Wedding Officiants who understand the need to offer something different and special. More and more couples are looking for Non-Denominational Ministers outside of a church wedding for numerous reasons.And we personalize your ceremony with your own thoughts and beliefs about love and marriage to make it all about you! Our goal is to turn your vision into a romantic reality. We will help you and your fiance create a personalized wedding ceremony that reflects who you are as individuals and as a couple.